A chalet to lighten up any corner of the garden. 50x50mm tanalised floor joists, fully rebated doors & frame, fully-glazed double doors, mortice lock and handle, 2 opening windows (4 opening windows in the 10’ model), 2 window boxes, toughened glass to bottom panes on doors, heavy-duty felt and diagonal bracing. High and low roof options available. 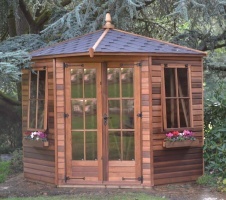 7’x7’ shown below with optional georgian glazing, cedar cladding and black felt tiles. A chalet to lighten up any corner of the garden. Also available with the low roof option avoiding the dreaded planning restrictions should your site require it.